Whether you are new to our parish or have been with us for awhile, you are welcome! This website features the many organizations, activities and services of St. Matthew. You can find information about Mass times, the sacraments, faith formation, parish ministries, support services and more. Check out our Calendar of Events or connect to our social media sites to stay up-to-date on parish news. See our parish directory or complete the Contact Us form under the About Us tab to connect directly with staff, clergy or religious. 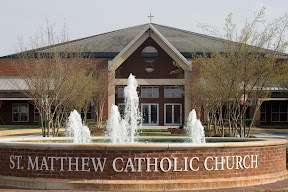 St. Matthew Catholic Church, a parish of the Roman Catholic Diocese of Charlotte, was founded in 1986 as a spiritual oasis in the thriving city of Charlotte. Now, over 30 years later, we continue to be a place of respite and reflection for all those who seek a connection with God. As Catholics, we believe the Eucharist (Holy Communion) is the real presence of Jesus Christ and that He lovingly offers Himself as spiritual nourishment with each celebration of the Mass. This intimate exchange with our Lord stengthens us spiritually and brings us closer to God. It also increases our capacity to love one another more fully and to live in Christian community together. Our membership has grown exponentially over the years from a few hundred to more than 10,500 families with the influx of Catholics to the South from every region of the country. We embrace our diversity with parishioners from all across the United States and many other countries. We believe each person is uniquely created by God – a living stone of our Church – and all are part of the body of Christ called to love and serve God, one another and the world. St. Matthew is an engaged parish connected in Christ and moved by the Holy Spirit. We believe in a living faith and express that through participation in more than 100 ministries that enhance the spiritual, social and service aspects of our lives. Our ministries are grouped into four general categories: Liturgy & Worship, Education & Faith Formation, Stewardship & Service, Parish Family Life, and you will find these and other programs listed under the Ministries tab on our homepage. Stewardship is also an important aspect of our parish life, and we believe in giving generously of our time, talent and treasure in service to the Kingdom. What is expected of me as a member of St. Matthew? What can I expect from clergy, staff and parish leaders? The Parish Covenant was created as a result of a parishwide survey in 2008 and sets forth clear expectations. Each year in September, parishioners are asked to recommit themselves to these expectations by signing covenant cards.